These two twin Munros have been on my to-do list for a while. As my husband says, you can't really go wrong with Assynt hills. Conival and Ben More Assynt may not be as well known and don't have postcard-perfect shapes like Suilven or Stac Pollaidh, but their hidden, secretive character makes a visit to them a fantastic expedition. We left our car at the car park near the Inchnadamph Hotel. We walked a short distance north along the road, past the bridge over the River Trallgill and then turned right to a private road. This took us well into Gleann Dubh. After crossing a gate we continued along the glen. Views were great from the very beginning. Looking back to the track down Gleann Dubh, with Loch Assynt in the distance and the bulk of Quinag to the right. When we reached the bottom of the first hill, Conival, ground became steeper and quite boggy. I imagine in bad wet weather this path must be a nightmare! The path zigzagged steeply up to a small hanging valley below the bealach between Conival and Beinn an Fhurain. There are lovely waterfalls just to the right. On higher levels the white quartzite cliffs of Conival are simply stunning! Climbing again! Steep or not steep, who cares! OK, the first part of the journey completed! ...and that's the second! What awaited us now was a short scramble up the white boulders and scree to the bealach. Don't worry, folks, it's an easy scramble. Once on the col, the rest of the route to the summit follows a well-worn path, although the amount of scree can be a bit annoying. Wow! Got there a tlast! Cup of tea and a sandwich - and we were on the move again. The final part included tackling the narrow ridge between Conival and Ben More Assynt. It may look scary from above but there's nothing technically difficult about it, especially in good weather. Hmm, my dad would certainly have a heart attack! ...and then down the way we came. Another excellent report, you guys are certainly having a fine year of hillwalking so far. Fab report - looks like you had a great day. Those crows were probably ravens - quite a big bigger than crows and more at home in the mountains. First time I've seen them on a summit cairn though. This report makes me want to head straight back up there! Excellent. 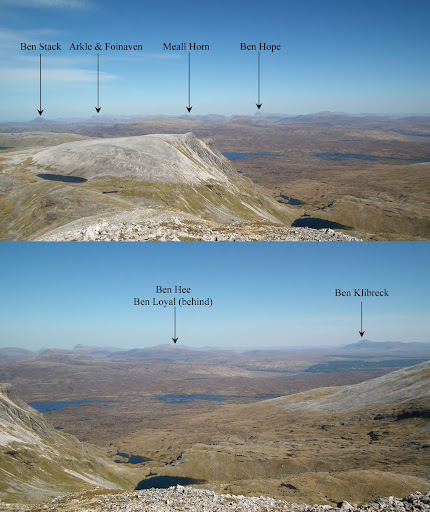 Like you said, Assynt hills are completely different from anything else. A particularly enjoyed this pair, and done it in similar conditions. A fine pair of munros coupled with a great walk. Great pictures there and still great weather. I must admit those two look like the rockiest Munros I've seen to date, care needed at all times I think. Like the shots of Cul Mor (where I was this day), shows the corrie in it well. Much better than the usual shots from the road side. I think Canisp and Suilven would have been blocking any view of the fires from here that day, and I guess any smoke got lost in (or created) the haze over that way. You would think you would be content with winning last months webtogs vouchers,and let someone else have a chance. Only kiddin BP another top notch report. Great report - lovely pics. As you may have gathered I love Wester Ross/Sutherland area - particularly Coigach and Assynt. Looks like you had a fantastic day, great pics. I was up those two last September. Above 600m nothing but cloud and hellish winds. No views at all. The ridge between the two looks good in nice weather, but in low visibility and horribly strong gusting crosswinds it was a bit different. Maybe it was good i couldn't see how far down i'd get blown off! I'll hopefully be making a return visit this year.